Can hemosiderin staining be dangerous? Generally, stains that last more than 12 months cause permanent marks as the skin has essentially been tattooed. Hemosiderin staining is a permanent, or semi-permanent, bruise-like mark that can vary dramatically in size, shape, and location on the body. Hemosiderin is an iron-rich protein that occurs in the body naturally. It’s made up of approximately 35% iron and stored in a form that the body cannot easily consume. Hemosiderin is created by a process that starts in our blood. Hemoglobin — a protein in red blood cells — carries oxygen throughout the body. When blood moves into tissue as a result of injury, hemoglobin decays and creates hematin. Bruises are caused when an impact damages blood vessels and allows blood to seep into surrounding tissues. Hemosiderin is one of the various substances responsible for the coloring of most bruises, which is why hemosiderin stainingso closely resembles bruising. Hemosiderin staining can essentially be regarded as a very severe form of bruising. Staining happens in areas where a significant amount of bruising has occurred as a result of severe injuries, hemorrhages or, in certain cases, after a particularly invasive surgery. When damage occurs, the surrounding tissue is flooded with blood and a bruise forms. The more severe the trauma, the more blood that leaks into surrounding tissues, signifying a greater presence of hemosiderin. It is difficult for the body to access the iron in hemosiderin. This, combined with the fact that iron is responsible for the coloration of hemosiderin, results in prolonged staining that is visible on the surface of the skin. Other than trauma, staining can also be a by-product of serious life-threatening conditions such as high blood pressure and heart disease. “When vein valves fail, regurgitated blood forces red blood cells out of capillaries,” explains Dr. Alex Roher of San Diego Botox. One of the more common reasons for valves leaking is chronic venous insufficiency (CVI), a condition where malfunctioning leg valves make blood flow difficult in an area. This creates pools of blood that result in hemosiderin staining. Hemosiderin staining is not only a cosmetic issue. The underlying leaking valves, like those found in CVI, can result in more serious complications. “If left as is, people can develop bad ulcers that are hard to treat,” cautions Shiloh. This can also lead to chronic pain, as well as stiffness in the leg joint. Internally, hemosiderin staining of the liver can be a sign of haemochromatosis, or an iron surplus in the body. Haemochromatosis is caused by genetic factors or by receiving multiple blood transfusions. It can lead to a bronze discoloration of the skin, as well as to cirrhosis of the liver, diabetes, and arthritis, among other issues. This staining can also occur in the brain after head trauma. A study published by the American Society for Experimental Neurotherapeutics suggests that patients with issues such as Alzheimer’s disease, Parkinson’s disease, and multiple sclerosis often have areas of the brain with increased iron deposits like hemosiderin stains. That being said, research into the effects of iron-rich areas of the brain is relatively new, and conclusions have yet to be definitively drawn. The main issue with hemosiderin is that the iron present within it is difficult for the body to consume. Once the body is able to use this stored iron, in the same way that the body uses iron derived from food, the stain will fade. In order to hasten the absorption of the iron present in hemosiderin, some sources suggest altering diets to reduce the total amount of iron in the body. Consuming less iron makes the body rely on its stored reserves. It is argued that forcing the body to more rapidly consume the iron in hemosiderin through this method will make the stains fade at a faster rate. While there is no concrete evidence for the success of this method, the effects of iron deficiency are well documented. A deficiency of iron can result in a lack of energy, focus, and the ability to fight off infections. Drastically altering a diet to reduce iron intake is not recommended without the approval of a recognized dietician. Over time, certain hemosiderin stains will fade naturally as the body slowly uses up the stored iron. This hands-off process can take several months or even years to completely remove all traces of the stain. Generally, stains that last more than 12 months cause permanent marks as the skin has essentially been tattooed. RELATED: What Is Sclerotherapy? Is It Safe For Treating My Varicose and Spider Veins? In cases where veins continuously leak, stains are unlikely to fade naturally over time, as hemosiderin is constantly present and replenished. Several options exist to speed up the healing process. The simplest, and most readily available, are topical creams applied to the stained area. These creams generally help to make the iron in hemosiderin more accessible to the body, and expediting its use. While creams specifically designed to deal with hemosiderin staining can potentially alleviate the issue, skin bleaches are not recommended for this purpose because the iron pigment is too deep in the skin to be accessed by the bleaching agents. “At our clinic, we use a laser to treat hemosiderin staining,” says Roher. Laser treatment for hemosiderin staining is a relatively new technique. Following a process not entirely dissimilar to tattoo removal, professionals target the area with a laser capable of rendering the iron more consumable by the body. “Most patients find this treatment painless, and one to two visits are all that are normally required,” states Roher. In cases where damage is more severe and veins continue to leak long after the initial injury occurs, treatment can be more difficult. Staining is unlikely to vanish naturally, and the typical treatments, which target the stain itself, will not be effective in the long-term. “Treatments for the underlying leaking veins can help,” says Shiloh. “These range from simple injections in the veins, to ablation of the deeper veins.” Ablation is a technique whereby radiofrequencies or lasers are used to cauterize leaking veins, like those present in CVI. In cases where the damaged vein has ceased leaking, topical creams may help speed up the healing process. The following creams target bruising and staining to offer quick relief without using bleaches. Using arnica montana (wolf’s bane) flower extract, vitamin K, and African ginger, this cream speeds the body’s natural healing process to improve the skin’s appearance. Heladerm recommends application to the affected area two to three times per day for the best results. In addition to bruising, the cream may also help erase dark under eye circles, skin discoloration, and hyperpigmentation. 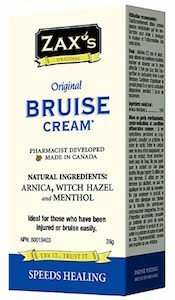 Arnica Bruise Cream by Miracle Plus is one of the most popular topical option for bruise fading at home. This cream uses L-arginine and horse chestnut to help improve circulation in the impacted area, and vitamin K to help heal and fade bruising. Miracle Plus’ Arnica Bruise Cream is non-greasy, and is quickly absorbed by the skin to minimize any staining to clothes. 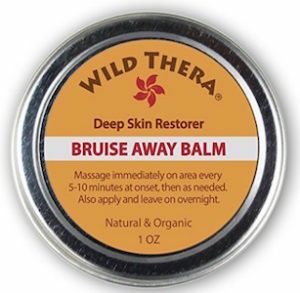 This bruise fading balm goes the natural route by incorporating organic herbs and essential oils into its non-GMO mix. Wild Thera recommends frequent application, as often as several times per hour, for optimal result. While a good option for light bruising and discoloration, a more robust treatment option may be required for severe hemosiderin staining. Zax’s home remedy uses a trio of well love natural skin care ingredients to encourage bruise healing: arnica, witch hazel, and menthol. 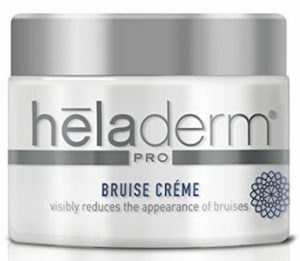 When applying the cream three times a day, most bruises will fade after a single week of use. Zax offers a refund if fading does not begin after one week of consistent application to assure satisfaction. 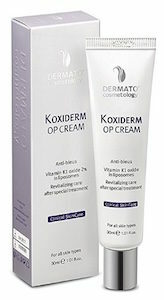 Dermato Cosmetology’s cream focuses of delivering vitamin K to the targeted area. This approach makes the cream a versatile option that may help to not only treat bruising, but also under eye circles, varicose veins, and spider veins. Users have said that they notice results after as few as three applications. However, several applications may be necessary for severe bruising. Dr. Brian Machida is a double Board Certified facial plastic surgeon with an outstanding level of experience. Unlike other plastic surgeons, who work on the entire body, Dr. Machida focuses only on the face and neck. Dr. Machida has been featured in the media and honored with prestigious awards countless times. He’s a recipient of the John Orlando Roe Award in Facial Plastic Surgery by the American Academy of Facial Plastic and Reconstructive Surgery and was featured in the Guide to America’s Top Physicians by the Consumers’ Research Council of America. He was also featured in the Top Doctors of the Inland Empire edition by the Inland Empire Magazine. Further, he has also presented his work at national conferences and published countless papers in scientific publications.